I first read this in 2007 while working as a reporter covering a county fair. Despite being surrounded by the stench of pigs and goats and fried foods, I was completely carried away to the world of Faerie. This is one of my favorite Gaiman novels and I think it’s a great introduction to his work if you’re wondering where to start. It’s a fairy tale for adults, similar in some ways to The Princess Bride. It is an adventure story, but it has a great sense of humor too. Tristran Thorne is a local boy living in the small English town of Wall. He falls in love with a pretty girl and makes a vow to find a fallen star to win her heart. He sets off on his quest, leaving the safe confines of Wall and venturing into the forbidden land of Faerie. What he doesn’t know is that he isn’t the only one searching for that fallen star. There are three sons of the Lord of Stormhold who are fighting to the death to earn the privilege of ruling their father’s land. To gain the Power of Stormhold they must find the star and the stone of power. There is also a witch who has spent decades wasting away with her sisters. When they see the star fall they realize that if they can reach it in time and get its heart they will be able to regain their youth. Despite these obstacles Tristran embarks on his journey to find Yvaine, the fallen star. BOTTOM LINE: It’s a lovely story filled with humor and adventure. I’d recommend it to fans of The Princess Bride or anyone looking to try a Gaiman novel. The story comes full circle in a wonderfully satisfying way. The characters are feisty, the lessons are good ones and it’s a quick read. "There is something about riding a unicorn, for those people who still can, which is unlike any other experience: exhilarating and intoxicating and fine." ** I got a copy of the new hardcover gift edition for Christmas. The blue cover and faded title are just perfect. The book includes an illustration and title heads drawn by Charles Vess and they are just gorgeous! If you already love the book then the gift edition is a must! *Image of the chapter heads from here. I've only seen the movie, but judging by that if there are differences then the book must be fantastic. Your new copy looks lovely, the way the chapter images extend beyond the "borders". Charlie - I love the chapter headings too. They're just beautiful! I've seen the movie, which I enjoyed, and I meant to read the book but never got around to it. Just yesterday I added it to my "To Be Read" list. :) Now, after your recommendation, it's moving to the top of that list! 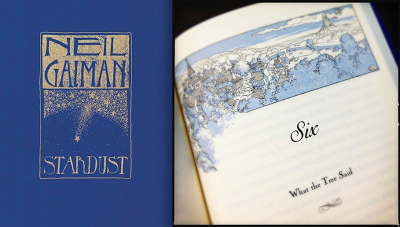 The Princess Bride is one of my favorite books, so I think I'll really enjoy Stardust. Looking at your Currently Reading makes me wonder how you read so very much? I read a lot, both for myself and to my kids, but I am amazed by you! Avid Reader indeed. I saw the movie of this one first; the other way around for The Princess Bride. I think I need to make this my next Gaiman book! Selah - I really love reading mutliple things at once as long as they are very different. Vanity Fair is a victorian classic, Song of Achilles deals with greek mythology, which is why I picked up Mythology by Hamilton. 1776 fills my need for nonfiction and Emerald City gives me a break from the big books. I also read in a lot of different formats, audiobooks, kindles, hardcopies, etc. so it's easier to have multiple books going at the same time. It works for me, but I know it doesn't work for everyone. Jeanne - That's funny. I think that always has an impact on what you expect from the book or movie (whichever you experience second). I'm less surprised at the number you read at once (I've usually got 5-6 books going at once myself) and more surprised by how quickly you seem to move through them. These are all different than the ones on Saturday, except Vanity Fair. What a lovely edition! I really enjoyed this novel, too. I've only read a couple of Gaiman's novels but Stardust is definitely my favourite. A friend of mine mentioned this book at our book club meeting the other night. We were reading Wyrd Sisters by Terry Pratchett and she said this was a novel that would be in harmony with Pratchett's writings. Think I need to give it a shot! Selah - Ha, yes I tend to be a fast reader. Some big chunksters, like Vanity Fair, take me a long time though! Melissa - It's one of my favorites of his too! Melissa Mc - Absolutely! Terry Pratchett and Gaiman actually wrote a book together, Good Omens, which is hilarious. Their styles work very well together. Charles Vess - Thank you so much for stopping by! I hadn't heard about that version, but now they're high on my list. The illustrations would add so much! I'll have to check it out as soon as I can get my hands on a copy. I've read so much Gaiman but have never gotten to this one! Can't believe I've missed it. Thanks for the great review, will have to add to go to the library ASAP. Nikki - I hope you like it! Teresa - I think this is a great place to start. I love the edition with the Charles Vess illustrations. He and Neil Gaiman work so well together!